Tartan has always been a go-to trend for Autumn/Winter, and 2018 is no exception. Rhianne Kelly shows us how to incorporate the timeless trend into our transitional wardrobe. The National Museum of Scotland, located at the heart of Edinburgh, houses a stylish navy and red tartan suit jacket complete with a red velvet collar and matching cuffs as the centrepiece of one of its exhibits. The jacket looks exceptionally modern. The catch? It is 273 years old. This, for me, sums up the fashion industry’s long-term, on-and-off relationship with tartan. The jacket in question belonged to Prince Charles Edward Stuart (commonly referred to as Bonnie Prince Charlie), who wore the coat in 1745 during an unsuccessful attempt to win back the British crown on behalf of the Stuarts (the Catholic monarchy of England). Now a whopping two-hundred and seventy-three years later, the fashion industry is continuing to find new ways to style tartan. This season’s biggest campaigns have been remarkably innovative and original in their takes on cosy-season fashion, and it is difficult to find one that did not feature the famous pattern in some way, shape or form. While it may not seem like a new and exciting trend (especially for any Scottish readers out there), tartan is back as one of Autumn/Winter’s leading trends and this year, it’s better than ever. From chic coats to smart trousers, playful skirts to oversized scarves, tartan is everywhere this season. As an avid follower of fashion, I’ve gone through many phases when it comes to what I wear (admittedly, some more embarrassing than others). The great thing about tartan, however, is that it is adaptable to whatever fashion phase you might be going through. Whether you’re going for a sophisticated look, a punk-rock vibe or a girly-girl aesthetic, having a couple of tartan staples in your wardrobe will always stand to you, no matter your mood. One of the first things that comes to mind when I think about tartan is the hugely popular 1995 rom-com, Clueless. Who knew Alicia Silverstone’s yellow tartan ensemble would become so iconic? 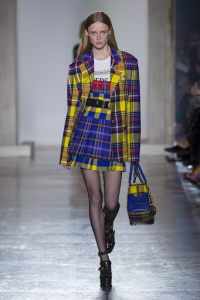 Well, Versace’s 2018 A/W show proved that the co-ordinated skirt suit is still well and truly on-trend, and while I would totally applaud anyone who shows up to college in the legendary yellow get-up, or indeed a Versace suit, many of us may want to take it down a notch when it comes to incorporating tartan into our day-to-day wardrobes. So, if you’re not feeling all that brave, why not lose the blazer, add a graphic white tee and layer with a simple leather jacket for the perfect daytime look. 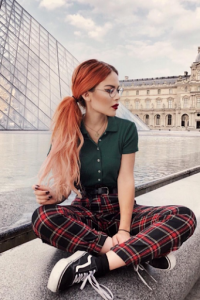 While designer Vivienne Westwood arguably initiated the tartan-punk aesthetic with her 1993 A/W collection by embellishing tartan suits with safety pins and black tulle, the trend is by no means dead and gone, and fashion blogger Luanna is true testament to this. For a contemporary take on punk-tartan, follow Luanna’s example by pairing some tartan trousers with a plain tee and your favourite trainers, or, for the more wintery days that are fast approaching, swap the t-shirt for a chunky knit and add a pair of simple black boots. It has never been so easy to incorporate tartan into an outfit, with popular high street stores such as Topshop, River Island and H&M stocking an abundance of tartan accessories on their shelves. Complete your casual jeans-and-a-jumper outfit with a chunky tartan scarf or add a cute tartan scrunchie to your everyday ponytail for a subtle dash of the iconic pattern which, in my opinion, is one of Scotland’s finest exports (no offence, Gerard Butler).